In antiques circles the ‘Holy Grail’ is a ‘sleeper’, an item that has remained undiscovered and untouched for many years. Similarly, for those involved with any form of vintage transport it is the ‘barn find’, which gets the adrenaline going. Tethered car and hydroplane enthusiasts are no different in this respect, and the thought of an ‘attic or shed find’ is so tantalising. Add to this the possibility of there being a collection of items, or that the cars or boats are identifiable and documented and that they may have remained undisturbed for 50 years or more and you are near to warp factor for excitement. What then if the items turned out to have ‘historic’ connections in terms of their owners and racing results. An impossible dream perhaps, but read on. Trawling through the listings on eBay as I do, I came across a description for a McCoy 60 engine, which mentioned that the vendor’s father had used it when he was racing tethered cars. It is always fascinating to be able to establish some of the background history of items, so off went an email to see if I could find out any more. A very prompt reply told me that the person in question was a Major in the British Army and that he had raced the cars in the early 50s, whilst based in Hannover. This was entirely plausible as there was a very strong tether car movement in that area at the time, due in no small part to the strong American military presence and their enthusiasm for ‘cable racing’. 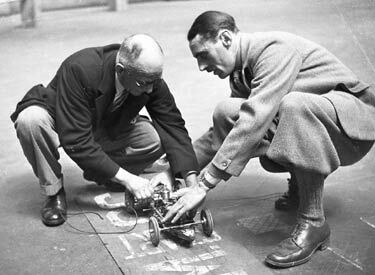 Another vital piece of information was that the cars involved had been raced at the Royal Horticultural Halls in London, and one of them had held a British Record for a period. This was much more helpful as the Horticultural Halls were the home of the Pioneer Club, and all their meetings were extensively reported in the Journals of the day. Not only did I now have an indication of the make of one of the cars, a Dooling F, and where it was raced, but Major B V Manley’s name as well. Sadly, Bernard Manley Died in August 2005, which prompted the sale of the engine; so all research would now have to be from secondary sources. It occurred to me that the chronology might be slightly wrong, as both the cars and venue were somewhat earlier, so I started looking through magazines from the late 40s and a very interesting story emerged. Major Bernard Manley was a serving officer in the RAOC and had been taken prisoner during ‘Operation Market Garden’, which was the ill-fated attack on the Rhine Bridges at Arnhem. Although he had been captured, his family was not informed of this and he was presumed dead. After his release and repatriation in 1945, he continued with his Army career and settled at Loose in Kent and eventually found himself based at the Woolwich Arsenal in South London. As part of his work he used to visit an underground government or military site somewhere in the Knightsbridge area of London. It was on one of his visits to this establishment that he met Guy Rickard, who was to become a dear friend and provide the catalyst to his involvement with tethered cars. 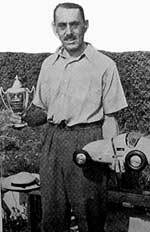 The friendship between Guy Rickard and Bernard Manley developed quickly on both a personal and competitive level, to the extent that Guy and Bernard raced as a team representing the Surrey Model Car Club, and travelled together to ‘away’ meetings such as the trip to the Eaton Bray Sportsdrome near Leighton Buzzard, a regular venue for tethered car racing. Research has revealed that the cars Bernard competed with all came from Guy Rickard’s own ‘racing stable’ but whether they were borrowed ‘gifted’ or purchased outright at the time is not known. Bernard, however, did become the owner of the cars, and they remained in his possession until his death. Bernard Manley’s first recorded appearance was at Eaton Bray Bedfordshire in early May 48 for the Austin Trophy meeting. 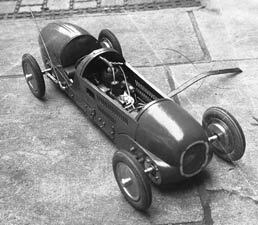 The car he used for this event was a ‘Hornet Special’, which was an exceptionally well engineered car based on a fabricated aluminium chassis, with an American 10cc Hornet engine. ZN Motors manufactured all the commercial components in the car, and it is likely that the car originally belonged either to E.P. Zere or Cyril Catchpole. 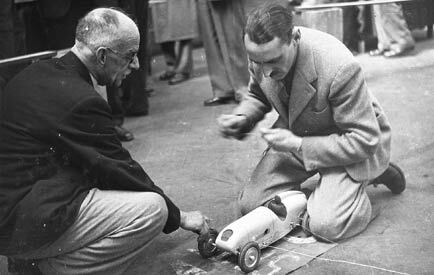 Although Bernard had been ‘burning the midnight oil’ to get the car ready for the meeting and the car was a ‘runner’, he had not managed to complete the bodywork. In this state the car ran at over 65 mph in round 1 of the competition. Round 2 saw the ‘Manley Special’ retire, ‘disliking its bonnet’. 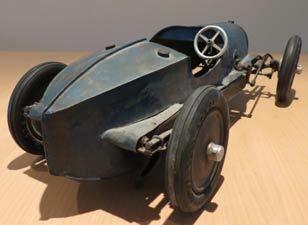 The bodywork problem was later solved by removing it all and replacing it with a one piece aluminium body from 1066. The next outing was on June 12th at the Royal Horticultural Halls for a Pioneer Club meeting competing for the Westbury Efficiency Prize, where the Hornet Special was replaced by Guy Rickard’s ‘gleaming scarlet’ Dooling F. The 10cc McCoy engine proved very reluctant to start and no run was recorded. The following day Manley and Rickard both trekked up to Eaton Bray again where they teamed up for the Drysdale Trophy. 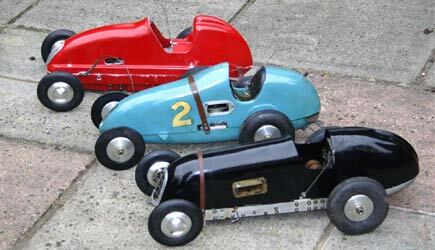 Two cars had to run, one after the other and the total time for the two runs, including starting and changing cars, determined the winner. After the failure of the Dooling the previous day, the ‘Hornet Special’ was pressed back in to action. 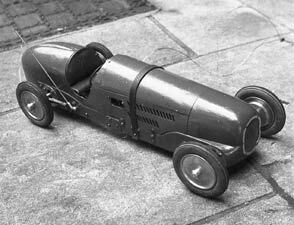 "The Surrey Club’s team opened the meeting; Maj B.V. Manley’s car ‘cracking off to a good speed’, but Guy Rickard’s 10cc McCoy special jibbed at starting" so their total elapsed time was over three minutes thirty, which left them well down in the results table. 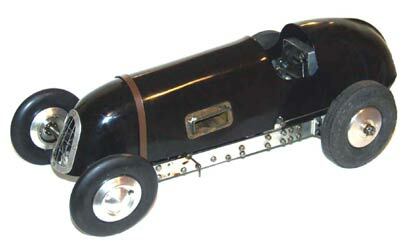 In both the Russell Trophy and Hastings Trophy meetings Manley entered a car called ‘Black Magic’. The Hornet car had by now been rebodied and painted black, but whether it was this car, or one that he had borrowed, cannot be confirmed. Recorded speeds of only 33.6 mph in the Russell event and 57.8 in the Hastings Trophy were well below the norm for the Hornet. Was it just a bad day or an entirely different car? The Surrey Club meetings took place at the delightfully named ‘home’ track of Christmaspie Normandy, and the June meeting resulted in a third place for Bernard with the ‘Hornet’ car. On the 25th July he recorded his best result yet, with a second place at 75.01 mph on the same track. 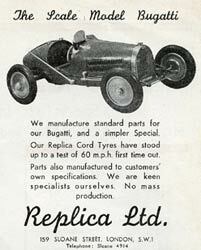 The last event for the ‘Hornet Special’ seems to have been on 25th Sept 48 for the Guy Rickard Trophy meeting. Each car was to be judged in a Concours d’Elegance and then complete three ¼ mile runs to a handicap, based on previous performances. The Concours element had to be abandoned and Bernard found himself ‘second on the wire’ in the first round. 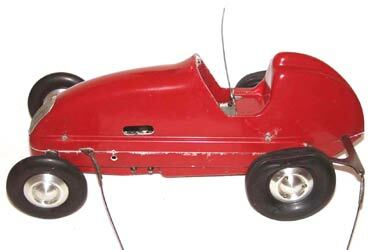 A fault with the ignition ‘knock off switch’ restricted the speed to 72.55 mph, instead of the target 80mph. The ‘Hornet’ was one of six cars that failed to complete the second run, which effectively eliminated it from the overall results. The ‘Hornet Special’ was consistent, but just lacking in pace so the McCoy engined Dooling F was expected to provide the extra speed, but had disappointed on the first outing. On its next appearance the bugs had been ironed out and the first competitive run was at 88mph, quite a leap by the standards of the day. The second competitive outing for the car was as a second entry at the Rickard Trophy on 25th September, but the promise of the previous meeting seemed to have evaporated as problems with the battery saw only 75 mph on the board in round one. With a new battery the car was in to its stride for round two with a 90 mph run against a target speed of 88. Round three was even quicker, with the car recording its fastest speed ever at 91.8mph. The aggregate of the runs gave Bernard 3rd place overall. Strangely, a 90mph run in the first round would only have moved him up to second place. As well as competing as a Surrey Club member, Bernard, became involved with the day to day running of the Club when the secretary, Mr C.E. Smith, had to go to America for a considerable while. Violet Rickard initially took over the reins in late 1947, but then Bernard became acting Secretary, and continued in that post until Cyril Catchpole’s appointment. The last meeting that Bernard Manley competed in during the 1948 season was at the Horticultural Halls on the 6th of November for the Lucas Cup, when he equalled his previous best result with another second place at 86.9 mph, again using the Dooling F.
In 1949 Bernard was posted from Woolwich to Donnington Park, which had been home to the British Grand Prix prior to being requisitioned for a huge army supply depot during the Second War. 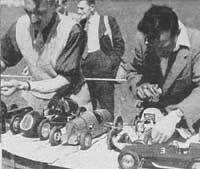 Moving to Donnington with his wife, daughter and very young son seemed to preclude any involvement with tethered car racing as there is no evidence that he competed at all during the 49 season. Almost immediately the family was on the move again when, in 1950, Bernard was posted to Germany, returning to Woolwich in 1953. Unfortunately no records exist of any of the competitions he took part in during his stay in Germany. There is, however, an interesting postscript to his recorded tethered car activities. It would seem that, prior to his move to Germany, Bernard had obtained a third car to add to his stable. Guy Rickard had originally been one of the ‘traditionalists’ with almost scale like cars and relatively low powered engines, but as soon as cars and engines started to arrive from the States (usually via service men posted over here) he embraced them with enthusiasm and his cars became out and out racing machines. The car Guy used for most events in the 1949 season was a McCoy based ‘special’ with a very distinctive hump backed body. 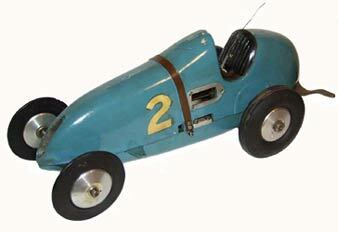 A leather strap secured the body which carried the number 2, his Surrey Club racing number. This car was his most successful up to that time and achieved an outright win in the ZN Challenge Cup as well as being the fastest ‘home car’ in the Anglo Swedish races held at Surrey’s Normandy track in October 49. 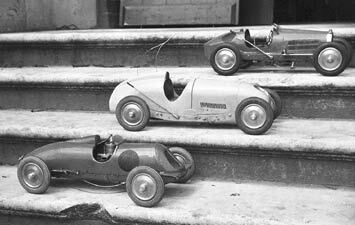 As quickly as tethered car racing had become popular in Britain so it declined, and by the time the Manley family had returned to Britain it was the pursuit of a very small band of dedicated and ultra competitive followers. The pit box containing the ‘Hornet special’ and the ex Guy Rickard ‘McCoy Special’ along with the Dooling F and accumulated spares was consigned to the loft where they remained undisturbed for 50 years. The condition of each of the cars is remarkable given the passage of time, each being original and untouched, with only the tyres suffering from ageing. It has been a delightful experience to be able to document a find of this nature; especially as the cars and racing records of the individuals involved are so well recorded. May 2006 The collection was sold via eBay producing quite surprising results. The sale started off with the Dooling F, sadly missing the original McCoy that had been sold earlier. Like the rest of the cars there was no reserve and a very low start price. A final price of £545 (nearly $1000) must be something of a record for an engineless ‘F’. 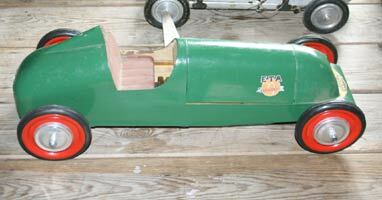 The ‘Guy Rickard McCoy Special’ Number 2 car was next up. 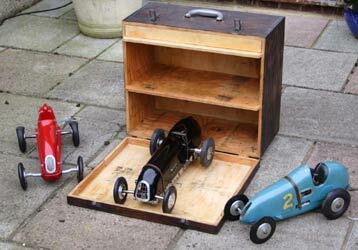 Pictures of Rickard with the car and its racing history helped it to top out for a whopping £1827 ($3,250). The revelation was the 1066 bodied Hornet special. A great deal of interest had been shown in this car, but it took everyone by surprise when it realised a staggering £2827 ($5000). This was in the Christies league and, again, must represent a record for a non-commercial car. Inevitably all the cars have gone abroad, but the article above can exist as a record of one mans involvement in tethered car racing. Thanks to Kevin Manley for additional information and photos. Guy Rickard (right in photos above) was an integral part of the tethered car scene in the immediate post war period being closely involved with both the Pioneer and Surrey Clubs. His involvement in the world of models started much earlier though, well before the second war. Guy Rickard had been born in Dorset in May 1905 into a moneyed background, with a connection to the Mitford family reflected in his Christian names, Guy, Moberly Mitford. The Rickard family travelled extensively including trips to Spain and South Africa, always first class. In 1933 Guy married Vera Horan (Bampfylde-Ellis) who had family connections to the British Shanghai Bank. The marriage coinciding with a sizeable inheritance from his mother meant that Guy was ‘of independent means’ and could indulge himself with his hobbies and interests without the inconvenience of working. The Rickards lived in ‘Cramptons’, a grand house in the hamlet of Beech near Alton in Hampshire where Guy seems to have been involved in a number of small outfits around the south coast producing early model aircraft engines. About 1935 Guy and Vera bought George Baster’s Bournemouth based Model Aircraft Stores business, which they established in Hankinson Road. Quite how Rickard came to be running tethered cars is something of a mystery, but it was probably down to the ban on the flying of model aircraft during the war. The Pioneer Club was formed as a result of the roof top meetings during the war, later running indoors at the Royal Horticultural Halls. The Rickards were not amongst the original ‘pioneers’ but appear to have started competing in 1946. 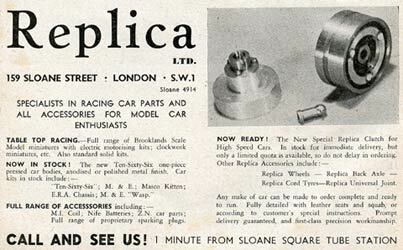 In addition there is mention of cars of the period being built from ‘Replica parts’, a reference to another company set up by Guy, opening a shop at 159 Sloane Street in London in 1946. 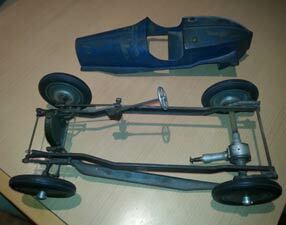 Replica supplied kits for a semi-scale Bugatti as well as wheels, tyres, a gearbox and clutch. Interestingly, the wheels and tyres were almost identical to those produced by 1066, who were operating just down the road in Pimlico at that time. There is a belief that Henri Baigent may have produced some of the car parts or even that an outside company may have been producing parts for both companies, given their similarity. The use of components from Precision Models would also tend to support this. In addition Replica could supply model railway items, IC and steam powered boats as well as a range of engines and tethered cars from established manufacturers. 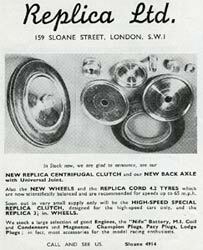 Replica Ltd advertised in the specialist magazines through to 1949 with the retail establishment in Sloane Street surviving until around 1956, by which time tethered car racing had changed dramatically and the mass market for cars and parts had vanished. If the Replica name faded from the scene, another was to become internationally famous and survived for much longer, ‘Veron’. The name was derived from Vera’s second Christian name, Veron(ica), used for kits and other items from the Model Aircraft Stores, and best known for its chief designer for many years from 1946, the late Phil Smith. 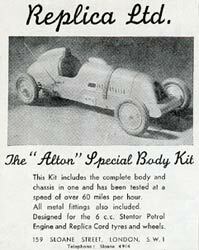 In 2009, he recalled how Guy had asked him to design a tethered racing car, specifically for the 6cc Stentor motor, the result being the ‘Alton Special’, taking the name from the Rickard’s home in Hampshire. 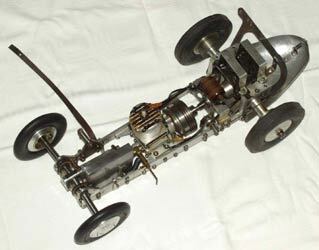 When Model Cars reviewed the new product in 1947 however, the prototype was reported to have been fitted with an Ohlsson 60 motor whilst the clutch and axle were 'heavy duty components from Precision Models in Cardiff. The family home had the luxury of a private tethered car track on the terrace, where Guy and Vera could run their extensive stable of cars, but not whilst the services were being held in the adjoining church. 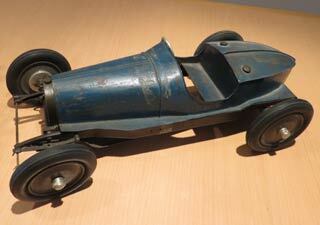 It is difficult to be precise about what cars they did run as they had 5cc, 6cc and 10cc models. 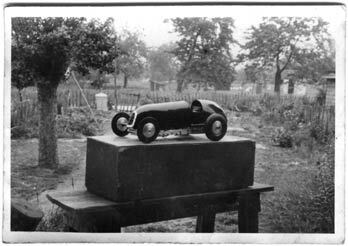 The near scale Bugatti is mentioned frequently as is the 10cc Ohlsson and a photo taken on a visit to their track shows a line up of six cars, including the prototype Alton. Guy and Vera were quite magnanimous, presenting solid silver trophies for Pioneer and Surrey Club events, as well as promoting the meetings at Christmaspie. Both of them appeared regularly in results from both tracks and at Eaton Bray, but neither seemed to make the transition from the style of cars preferred by the ‘pioneers’ to out and out racing models, an opinion shared by many, which eventually led to the Pioneer Club fading away. Guy did obtain the Dooling F and ‘Rickard Special’, running this in 1949, but the closure of the Surrey track appears to have brought and end to the Rickard’s racing careers. 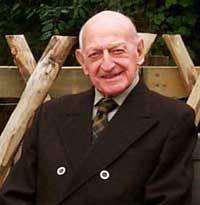 Guy Rickard died in 1978 having married Dorothy Wills in1965 following the death of Vera a year earlier.